OFFENSE: The emphasis on this group will shift from a wide open offense to an attack that will be focused on the running of Chris Johnson, as he will go from a talented piece of the ECU puzzle to the main focus of the game plan. Major improvement will be needed from an offensive line that struggled last season, giving up 27 sacks, and not generating enough of a push to establish a consistent running game. The line does return 4 starters and is experienced, which is good news for QB Rob Kass, who steps into the large shoes of departed 4 year starter James Pinkney. DEFENSE: The unit improved a great deal last season, allowing 20.8 points per game, the lowest for ECU since 1999. The defense returns 8 starters and will be led by one of the top defensive lines in the league, as 8 players who started games last season return. Further improvement in the line is expected with the addition of UNC transfer Khalif Mitchell, who will make a huge impact, literally as he weighs in at 320 pounds. The concern is a secondary that loses 3 starters after finishing 3rd in the nation last year in pass defense. The defensive line must generate a strong rush in order to give the inexperienced secondary time to develop. SPECIAL TEAMS: This is an area of concern after both the kicker and punter have departed. Assuming the role of kicker is Ben Hartman, who hit on 3 out of 5 attempts last year, including a 47 yarder, while Matt Dodge takes over the punting assignment after averaging 40 yards per kick last year while attending Appalachian State. The return game has both starters back, and Chris Johnson is capable of turning the kick return unit into a team strength. COACHING: Skip Holtz enters his 3rd year at the helm of the Pirate program, and will look to build upon his 12-12 career record. Holtz guided ECU to their 1st bowl appearance in 5 years last season when the Pirates lost to South Florida in the Papajohns.com Bowl. Even with the bowl loss, ECU had its 1st winning season since 2000, and the program has been rebuilt into a CUSA contender. An addition to the staff this year as co-offensive coordinator is Todd Fitch, who arrives at ECU from Iowa State where he was the quarterback coach. SCHEDULE: The schedule is difficult with non-conference road trips to Virginia Tech, West Virginia, and home dates versus ACC foes North Carolina and North Carolina State. The key conference date is on September 15th when one of the East division favorites, Southern Miss, pays a visit to Greenville. Also circle November 3rd on the calendar when the Pirates travel to a rejuvenated Memphis squad for a key divisional battle. IF EVERYTHING GOES WELL....ECU makes a run at the East division title and returns to the postseason for the 2nd consecutive season. The offensive line builds on its year of experience to provide a solid foundation for an offense that is breaking in new skill position talent. The defensive line reaches its full potential and becomes the leader of one of CUSA’s better units. IF THINGS DON'T GO SO WELL....The Pirates lose 4 of their first 5 games as the new skill position starters do not develop as anticipated and the offense struggles to become a cohesive unit. The secondary is exposed and the defense struggles to keep opponents off the scoreboard as the Pirates drop below .500 in this balanced league. MAKE OR BREAK: The Pirates should circle the September 15th game versus Southern Miss, as a loss in this key game would likely put an end to ECU’s division title hopes. New QB Rob Kass will be relied upon to direct the new offense, and he is the typical drop-back passer with a big arm, an adjustment from the play of former QB Pinkney. The level of Kass’ play could decide whether there will be postseason play for ECU in 2007. OFFENSE: The Cougars rely on a spread offense that uses a short passing attack to open the field and get players into open spaces. The face of this program for the past 4 years was QB Kevin Kolb, and now it looks to be Blake Joseph’s turn to take the helm. The good news for Joseph is that Houston returns a strong running game led by Anthony Aldridge, who will get to run behind one of CUSA’s best lines. Even with the loss of Kolb, this group remains strong. DEFENSE: This will be one of the league’s best units with 7 starters returning and a defensive line that has the potential to be the league’s best. The top player on the line is Phillip Hunt, who had a huge 2006 season, recording 12 tackles for a loss and 8 sacks as he was a permanent fixture in the opponent’s backfield. The focus for defensive coordinator Allen Weddell will be to address a secondary that loses its top two defensive backs as cornerback Ken Fontenette will be relied upon heavily to lead this relatively inexperienced group. SPECIAL TEAMS: The focus of this group will be on improving a punting game that finished last in the conference in 2006, averaging 37.9 yards per punt. Redshirt freshman Tommy Skinner is expected to take over the punt duties, and the staff is hoping for a huge step up in 2007. The kicking looks to be in good shape with Ben Bell returning after hitting on 14 of 18 attempts last year, but Bell did struggle with long kicks. The kick return game is strong led by Anthony Aldridge, but the punt return unit is a concern and will rely on two freshman, Teric Williams and Randall Antoine, to improve the group. COACHING: After 4 years in charge of the Houston program, Art Briles has taken this team to the top of CUSA and 2 consecutive bowl appearances. Briles was named the conference coach of the year as he guided UH to a 10-4 record, which included winning their last 6 contests to complete the regular season. He remains the architect of the complex offense as Briles also maintains the role as offensive coordinator. SCHEDULE: Highlighting the non-conference schedule are two road trips to national heavyweights Oregon and Alabama, and an interesting contest with Colorado State. Key divisional contests look to be an October 27th trip to UTEP, a visit from SMU on November 4th, and a November 10th game at Tulsa, the main challengers to Houston in the West division. IF EVERYTHING GOES WELL....Houston repeats as CUSA west division champion and plays in its 3rd straight bowl game. Blake Joseph steps in for Kolb and provides strong leadership and utilizes all the talent that still remains in their potent offense. The Cougar defensive line overpowers opponents, and combined with the quick and attacking linebacking corps, they provide Houston with the best front in the league. IF THINGS DON'T GO SO WELL....This team has too much talent to drop to far in the league standings, but a drop into 3rd place in the West would make for major disappointment. The defensive secondary lack of experience is exposed early in non-conference games with Oregon, Colorado State, and Alabama, providing CUSA opposition with an area to focus on when attacking the Houston defense. MAKE OR BREAK: The West division title could very well come down to the November 4th game versus SMU, a game that Houston won 37-27 last season. Running back Anthony Aldridge must assume an even greater role in the offense as Houston breaks in a new quarterback. Aldridge is a major talent and his touches will greatly increase in 2007 as he must be a key cog in this offense. OFFENSE: This group has the potential to be Marshall’s best unit in years, and could have been lethal if leading rusher Ahmad Bradshaw would have returned instead of heading to the NFL. Still remaining is a top-notch offensive line that is led by center Doug Legursky, a 1st team all CUSA member as a junior. The line will be needed to open holes for the new running back in Chubb Smith and to provide QB Bernard Morris the time to find his talented receivers, led by tight end Cody Slate. DEFENSE: This unit was run over, around, and through last year, yielding 29.2 points per game, ranking 102nd in the nation. There is no question at one defensive end position as Albert McClellan is back for his sophomore season after earning 1st team all conference honors last year. Two new starters are needed around McClellan in order to keep opposing offensive lines from constantly double teaming the star of this group. A major overhaul is required in the pass defense, which gave up 251.7 yards per game and ranked 114th in the nation. Two young corners in Zearrick Matthews and Ashton Hall will be relied upon to play more one-on-one coverage this season in the hopes of utilizing the safeties in a more aggressive defensive approach. SPECIAL TEAMS: This group has some issues, led by the kicking of Anthony Binswanger, who only connected on 5 of his 13 attempts last season and also missed 4 extra points. The punting is just as big a question, if not bigger, as projected starter Marty Biagi was hurt in spring practice and is likely to miss the early part of the 2007 season, making freshman Jake Fields the early favorite to assume his duties. The return game should be solid with Emmanuel Spann back to handle punts after averaging 12 yards per return last year and Chubb Small handling the kick return duties, with Spann also seeing time teaming with Small. COACHING: The pressure is on Mark Snyder as he heads into his 3rd year in charge of the Marshall program. Snyder is 9-14 in his career with the Herd finishing under .500 in his 1st two seasons, the 1st time in 25 years for this program to record back-to-back losing campaigns. A new face on the staff is defensive coordinator Steve Dunlap, who joins the Herd after serving in the same capacity at North Carolina State for two seasons. Dunlap has the mammoth job of improving a defense that struggled in all aspects of the game last season. SCHEDULE: The initial 2 weeks of the season will tell a great deal on how this program is progressing as the Herd travels to Miami in week #1, then returns home to battle in-state rival West Virginia. Marshall has a nice schedule within the division, hosting Southern Miss and East Carolina, but must travel to Western division foes Houston and Tulsa. The finale at home against UAB could be the difference between a bowl bid and staying home for the holidays. IF EVERYTHING GOES WELL....Marshall returns to the postseason for the 1st time since 2004. The newly installed aggressive defense frees up Albert McClellan to continue his reign of terror on opposing QB’s and greatly improves upon last year’s pass defense. The tough Herd offensive line gives RB Small and QB Morris enough room and time to build on last year’s strong offensive output. IF THINGS DON'T GO SO WELL....The Herd loses 5 of its first 6 games and ends the year with their 3rd straight losing season. McClellan remains the only star on the defense and the secondary is unable to improve upon last year’s disastrous results. The early departure of RB Bradshaw to the NFL depletes the offense as the Herd are unable to keep pace with the opposition. MAKE OR BREAK: QB Bernard Morris must step up and play better this season after an 8 touchdown to 12 interception ratio last year. Morris has nice talent to work with in the receiving corps, especially Cody Slate, and he is capable of making major improvements in his final season. If Marshall is to entertain bowl hopes, the September 22nd game at Cincinnati is a huge contest, as is the conference opener on October 2nd at what looks to be a much improved Memphis team. OFFENSE: The Tigers struggled last season in adapting to a new offensive scheme as Memphis installed the spread attack. This year should show major improvement as quarterback Martin Hankins returns for his senior season along with his top target in wide receiver Duke Calhoun. Even better news for Hankins is the return of a deep and experienced offensive line and the entire stable of running backs. After a year of experience in learning the new system and the return of 8 starters, there is excitement in Memphis about this group’s potential. DEFENSE: Like the offense, the defensive unit also returns 8 starters, but this group had major problems last year, giving up 408.7 yards per game, ranking 111th in the nation. The strength of this group looks to be a defensive line that returns 8 players with starting experience, but they will need to become much tougher in playing run defense. The secondary struggled in coverage last year and have added transfers in Tony Bell (Auburn) and Dontae Reed (Mississippi) to sure up this unit. Expect major improvement out of this year’s group. SPECIAL TEAMS: New faces will need to step up in this group as Brent Sutherland takes over the punting duties, after averaging 36.6 yards per punt in junior college last year. Kicker Matt Reagan is back after a solid freshman season where he hit 12 of 17 kicks, including 3 out of his 6 kicks from beyond 40 yards. In reviewing the return game, auditions for punt return duty are being held after the loss of Brandon McDonald, who ranked 3rd in the conference last season, while kick returns appear to be a major strength with the return of Michael Grandberry, who led CUSA last year with a 24.6 average. COACHING: Tommy West is heading into his 7th year in charge of Memphis, and he has guided the Tigers to 3 bowls during that time, the school's 1st appearances since they made their postseason debut in 1971. Last year West made changes to the offensive and defensive philosophies, switching to a spread offense and a 4-3 defense. The changes led to major staff turnover, and 6 new faces will be on the Memphis sideline when the 2007 season begins, led by new defensive coordinator Rick Kravitz, a 22-year coaching veteran. SCHEDULE: The Tigers open their non-conference schedule at home versus Mississippi, a staple of past Memphis schedules. The Tigers also will battle 2 Sun Belt foes with a trip to Arkansas State and a visit form in-state rival Middle Tennessee State. The Tigers must travel to East division challenger Southern Miss, but do not play tough West division foes in Houston, Tulsa, and UTEP, a nice scheduling break to help the acceleration of the rebuilding process. IF EVERYTHING GOES WELL....There is enough talent on this team to make a run at the Eastern Division title, after the Tigers won only 2 games last season. UM had numerous close losses last season, and with a year of experience for the 16 returning starters, those close losses turn into close wins and help return Memphis to the postseason after a one-year absence. IF THINGS DON'T GO SO WELL....The defensive struggles continue for another season as the Tigers record their 2nd straight losing season. Also contributing is the major turnover in the coaching staff, which reduces the cohesiveness of the offense and defense as both units are unable to reach their potential. In a balanced division like the East in CUSA, a last place finish could be the final result. MAKE OR BREAK: The Tigers have opened conference play on the road for 10 straight seasons, and have lost 6 consecutive openers. This year a trip to Central Florida opens CUSA action and is a key game for Memphis if the Tigers are serious about contending for a conference title. Also note the last two weeks on the calendar, as Memphis will be looking to end a 7-game losing streak against UAB before completing the season by hosting an SMU team that looks to be in the postseason hunt. If this team is going to reach its potential, quarterback Martin Hankins needs to go from good to great and become one of the top QB’s in CUSA. OFFENSE: The spread offense installed last season looks to remain in place even with a new coaching staff coming on board. Quarterback Chase Clement combines with wide receiver Jarrett Dillard to give the Owls the top passing combination in the league. Dillard had 91 receptions last season and 21 touchdowns, which resulted in him being named 1st team All-CUSA and 2nd team All-American by the Associated Press. The key is to find a replacement for departed running back Quinton Smith, who played a key role in keeping the Owl offense balanced. DEFENSE: The defense will be switching to a 4-2-5 formation in the hopes of improving on last season, a year in which Rice ranked 112th in the nation in total defense. The new formation will rely heavily on the defensive line to generate pressure, a group that was hit hard by graduation, returning only 1 starter after struggling all of last season. Linebacker Brian Raines is the top playmaker on this unit and will be expected to surpass his 118 tackles of last season. The secondary is young and needs to improve on its 32 touchdown passes yielded a season ago. SPECIAL TEAMS: Returning after earning freshman all-conference honors is kicker Clark Fangmeier, who was 8 of 11 last season, connecting on all 35 extra points. Fangmeier is only used on short range kicking duties, as Luke Juist handles the kicks outside of the 40 yard range in addition to being the Owls' punter. Brandon King is an excellent punt returner, averaging 8.8 per return, while Chris Douglas handles the main kick return responsibilities. COACHING: With the departure of Ken Hatfield after 12 seasons at the helm, Todd Graham took over last season and guided the Owls to their 1st bowl trip since 1961. But once Tulsa head coach Steve Kragthorpe decided to leave for Louisville, Graham chose to return to his former employer, taking over at Tulsa after only one season in Houston. Enter David Bailiff, who will take over after spending the last 3 seasons as the head coach at Texas State. Bailiff took TSU to the Division 1-AA semi-finals in 2005 after winning the school's 1st Southland Conference championship. SCHEDULE: The Owls open up with 1-AA foe Nicholls State before a 3 game stretch versus Big 12 conference foes in Baylor, Texas Tech, and Texas. The start of conference play could not be much tougher with games at Southern Miss and Houston, but it ends with two home contests as Tulane and Tulsa visit Rice Stadium. IF EVERYTHING GOES WELL....The Owls play .500 ball for a 2nd consecutive season and are eligible for postseason play. The offense is lethal led by Clement, Dillard, and an experienced front line, while the running back-by-committee approach is strong enough to keep defenses honest. The newly installed defensive scheme improves the run defense and makes a star out of linebacker Brian Raines. IF THINGS DON'T GO SO WELL....The turnover in coaching staff and 3rd system in 3 years keeps the returning experience from reaching their potential. The Owls defense does not show enough improvement as opposing offenses continue to light up the scoreboard, and Rice battles with Tulane to stay out of the cellar in the West division. MAKE OR BREAK: The pass defense must improve for this team to be competitive and the entire secondary will play a key role in this team’s results. Cornerback Brandon King will be expected to take a leadership role in the inexperienced group and to combine with Ja’Corey Shepherd to greatly bolster this unit. Key games for Rice’s bowl hopes look to be an October visit to Marshall followed by a November 3rd visit from UTEP and a trip to SMU in divisional contests. OFFENSE: The SMU offense has the potential to be one of CUSA’s best units, and will be led by the combination of quarterback Justin Willis, running back DeMyron Martin, and receiver Emmanuel Sanders. Martin will play a key role this season after missing 5 games last year due to injury, and he will be running behind an experienced offensive line that returns 9 of its top 10 blockers. Willis is as dangerous running as he his throwing, and he has a great knack of finding his way out of trouble when the pocket breaks down. DEFENSE: The concern of this group is a defensive line that needs to replace 3 starters from last year’s solid group. Cory Muse is the best of the returning players and will combine with Patrick Handy for a solid group of defensive ends. The defensive tackle position will be an area of focus heading into the fall and needs to improve greatly if this group has a chance of slowing down opposing offenses. On the opposite side, the linebacking corps is established, returning 3 starters to one of CUSA’s top groups, and this unit will be relied upon heavily to compensate for the inexperienced defensive front. SPECIAL TEAMS: The kicking and punting duties are handled by one person in Thomas Morstead, who averaged 43.8 yards per kick and connected on 13 of 18 field goals, including a 50 yarder. The kick return game is well taken care of with Jessie Henderson, who averaged 36.9 yards per return in his 10 attempts before being lost due to injury. Emmanuel Sanders looks to be given a shot at improving on last year’s punt return unit, which finished 8th in the conference. COACHING: Head coach Phil Bennett is heading into his 7th year in the top position at SMU and appears to have this program on the upswing after years of struggles. Bennett has a career mark of 17-41, and finally returned the Mustangs to the .500 mark last season. Now he has his sights set on earning the school's 1st bowl bid since 1984. The addition of offensive coordinator Rusty Burns has greatly improved the SMU offense in his 2 years in Dallas. SCHEDULE: Two games highlight the non-conference slate in an opening visit from Texas Tech and a September 22nd trip to Texas Christian, while Sun Belt members Arkansas State and North Texas complete the out of conference lineup. The conference schedule does not do SMU any favors as the Mustangs must travel to Southern Miss, Tulsa, and Houston, putting a major dent in the their title hopes. IF EVERYTHING GOES WELL....The Mustangs have compiled enough talent to achieve a postseason berth, ending a 23 year drought. SMU sweeps its 4 conference home games behind an offensive unit that has developed into one of the league’s best groups. and the wealth of available talent in the linebacking group and secondary conceal inexperience in a still-developing defensive line. IF THINGS DON'T GO SO WELL....The Mustangs lose 3 of their first 4 games and they are unable to overcome a tough CUSA road schedule, losing all 4 contests. The run defense is weakened by an inexperienced defensive front as opposing QB’s do not even have to challenge a tough SMU secondary as they can run right through the Mustang defenders. Running back DeMyron Martin is unable to remain healthy and cannot provide SMU with a legitimate rushing attack. MAKE OR BREAK: The key schedule stretch looks to be the final 3 games, as SMU hosts Rice and Central Florida, and then completes their season at Memphis. Like last season, the final game of the year could be the difference between a postseason berth and being home for the holidays. DeMyron Martin must be a key contributor to this offense to keep defenses from swarming QB Willis and WR Sanders. OFFENSE: The Eagles prefer to pound away on the ground, and they have more than enough horses to unleash the top running game in CUSA. The first option is Damion Fletcher who was named to the CUSA 1st team last year after rushing for 1,388 yards and 11 touchdowns. Two other top backs are expected to earn playing time in Tory Harrison, who averaged 6.3 yards per carry last year in a back-up role, and incoming recruit Antwain Easterling, who received scholarship offers from Notre Dame, Florida, and Miami before deciding on the Eagles. A key for USM will be to find replacements for 3 departed offensive linemen, including two 1st team CUSA players in George Batiste and Travis Cooley. DEFENSE: Southern Miss always unleashes a fast and athletic defensive unit, and 2007 looks to be no different. The defensive line should be dominant and looks to be the best group in CUSA, led by defensive tackle Martavius Prince, who collapses the pocket and stuffs opponents' running games on a consistent basis. If opposing backs are lucky enough to get through the front four, they will run into the top set of backers in the league, with Gerald McRath leading the charge. The Eagles need to find a replacement for two starting corner backs, the only area of concern on this top flight unit. SPECIAL TEAMS: There could be issues with this group after the loss of star kicker Darren McCaleb. Stepping into McCaleb’s shoes will be either incoming freshman Justin Estes or punter Britt Barefoot, so consistency is a concern with this unknown group. Barefoot was the starting punter last season and struggled on the year, only averaging 38.6 yards per kick. A new kick returner is likely to take over this year as Ralph Turner is expected to provide a major improvement over a unit that finished 9th in the conference last year. COACHING: Head coach Jeff Bower has built this Southern Miss program into national power, with 13 consecutive winning seasons and 9 bowl trips in his 16 year tenure. Bower has an excellent career record of 112-77-1 and has been named the CUSA coach of the year on 3 different occasions in 1997, 1999, and 2003. He had to replace one of the younger stars of his staff in the off-season as Derrick Nix left his post as running back coach to accept a position with the Atlanta Falcons. Bower promoted from within as Courtney Messingham was selected to fill the open position. SCHEDULE: The Eagles always put together a tough non-conference schedule in preparation for CUSA action. After opening with a slam dunk versus Tennessee-Martin, the Eagles travel to Tennessee, then make a tough road trip to open the conference at East Carolina. After a week off, USM remains on the road, traveling across the country to visit Boise State. Other key conference games are trips to Marshall and UTEP, and a home contest versus Central Florida on Sunday, October 28th. IF EVERYTHING GOES WELL....Southern Miss wins 10 games, returns to the CUSA championship game, and takes back the crown they gave up to Houston last year. The defense is more suffocating than last year’s excellent unit, while the offense unleashes the top running game in the league as USM plans to control the ball and the clock, the same game plan as past Eagle championship teams. IF THINGS DON'T GO SO WELL....USM gets hammered in their game at Tennessee and cannot regroup the following week as they get tripped up at East Carolina. This team has too much talent to slip past 3rd in their division, but if the offensive line does not develop with 3 new starters, the stellar backfield could prove to be ineffective and the offense will struggle. MAKE OR BREAK: Worthy of mention again is the September 15th game at East Carolina as its place in the schedule is very dangerous. Also of note is that the Pirates handed USM their only regular season conference loss last year. Quarterback Jeremy Young will need to show improvement after putting together a solid junior season, but he needs to increase his completion percentage from 57.3%. With the stable of backs at his disposal, improvement by Young can make this Eagle offense tough to slow down. OFFENSE: The focus of the Green Wave offense is running back Matt Forte, who is returning from a knee injury that prematurely ended his 2006 season. In the 9 games he did play, Forte rushed for 859 yards, scored 8 touchdowns rushing, and caught 28 passes for another 2 touchdowns as he proved to be a multi-dimensional player. Even with Forte being the top option, the Green Wave will work to develop more of an aerial attack and will require quarterback Scott Elliot to step in and be ready to throw, with Jeremy Williams being his top target after reeling in 40 receptions last season. DEFENSE: This group struggled mightily last season, finishing 108th in the nation, yielding 399.7 yards per game and 33.3 points. Eight starters are back on this unit, and the hope is that the additional experience will lead to major improvement. The defensive line looks to be a team strength, with veterans Antonio Harris and Frank Morton anchoring the middle. But for this defense to show a significant upgrade, the secondary will need to find 2 new starting cornerbacks; otherwise opposing QB’s will be torching this group yet again in 2007. SPECIAL TEAMS: Question marks are all over when reviewing this unit. The kicking duties will fall to Ross Thevenot, who made 9 out of 15 last season, but only connected on 2 out of 6 attempts from beyond 40 yards. Thevenot may also assume the punting duties if last year’s part-time starter Barrett Pepper does not receive a medical waiver to compete from the NCAA. Fred Smith is the projected go-to guy in both the punt and kick return and will look to improve upon a 7th place conference showing in punt returns and a last place finish in kick-off returns. COACHING: The Green Wave brings back a familiar face to the college football landscape as Bob Toledo returns to the top spot on the sideline after spending last year as the offensive coordinator at New Mexico. In addition to his assistant duties, Toledo was the head coach at UCLA for a 7 year run that ended in 2002. The new defensive coordinator is Thom Kaumeyer, who built strong units at San Diego State, while Toledo will call his own plays, though he did bring Dan Dodd on board as offensive coordinator. SCHEDULE: It's a nice way to start the season as the Wave opens at home for their first 4 games, an interesting mix that include SEC foes Mississippi State and LSU, last year’s CUSA champ in Houston, and 1-AA opponent SE Louisiana. After staying in the Superdome for the month of September, the Wave will head to the road for most of October, visiting Army, UAB, and SMU on 3 consecutive weekends, before returning home for 3 more contests, highlighted by a visit from Tulsa. IF EVERYTHING GOES WELL....Tulane is able to improve their defense enough to even their record at .500, recording 6 wins on the season. Matt Forte returns at 100% and continues his all-around excellent play as a dual threat out of the backfield, helping to ease the transition of new QB Scott Elliot. Bob Toledo’s offense develops as the team gains experience in the new system and there is positive momentum in this program. IF THINGS DON'T GO SO WELL....A repeat of last season is the result with the potential to win less than 4 games as both units try to learn new systems and have trouble adapting. The new cornerbacks are not yet ready for primetime, and opponents have no problem overwhelming the Wave secondary yet again this season. The new aerial attack cannot get on track as the offensive line continues to struggle after yielding 29 sacks last season, as Elliot is forced to run for his life. MAKE OR BREAK: The home opener against Mississippi State is huge for this team’s psyche. A win over an SEC foe can be a nice building block heading into the following week when West division favorite Houston visits. Scott Elliot is the likely starter heading into the season, but redshirt freshman Kevin Moore was a nice recruit and is capable of taking the starting assignment as well. Either way, experience at quarterback is minimal and the Wave will need someone to emerge as a passing threat to keep defenses honest. OFFENSE: The unit will be focused around returning 2nd team CUSA quarterback Paul Smith, who enters his 3rd season behind center. Smith will need to have his track shoes on as the Golden Hurricane offense will be on the run all game long, as the staff will utilize a spread offense, focused on playing fast. Smith will have a nice cushion to fall back on, as he will be handing the ball off to talented running backs Courtney Tennial and Tarrion Adams, who rushed for a combined 1,174 yards last season and 16 touchdowns. The offensive line must be rebuilt with only 1 returning starter, and the inexperienced group must also learn a new system. DEFENSE: The Hurricanes will return to a 3-3-5 defensive set and will rely heavily on a stout defensive front wall, led by nose tackle Terrel Nemons. The linebackers appear to be just as strong as the line with Nelson Coleman back after leading the team last season with 98 tackles and earning 1st team CUSA honors. The group is experienced as all 3 starters are seniors with Coleman and Chris Chamberlain each starting all 4 years at Tulsa. The secondary will need to be addressed after the graduation of 3 starters, with cornerback Roy Roberts the lone returnee in the group. SPECIAL TEAMS: Kicking does not appear to be an issue as Jarod Tracy returns after hitting on 11 of his 12 attempts last season, including a long of 50 yards. Also back is punter Paul Jurado, who averaged 40.5 yards per kick in his 18 attempts. The return units will need someone to emerge, with Charles Davis the likely candidate to handle both positions. COACHING: New head coach Todd Graham returns to Tulsa after spending one season at Rice, taking them to their 1st bowl game since 1961 in his lone season with the Owls. Graham was the defensive coordinator at Tulsa in the 3 seasons prior to taking the job with Rice. Coming with Coach Graham will be his offensive coordinator Gus Malzhan, who spent last season with Arkansas, and his co-defensive coordinators Paul Randolph, who returns from Rice, and Keith Patterson, who is in his 4th season on the Tulsa staff. SCHEDULE: The conference schedule lines up nicely for Tulsa, getting Houston and SMU at home and avoiding Southern Miss and Memphis from the East division. The toughest road contest in the conference looks to be an October 6th visit to UTEP. The non-conference slate has two powerhouses in BYU and Oklahoma, who both come to Tulsa, and road trips to Louisiana-Monroe and Army. IF EVERYTHING GOES WELL....Tulsa earns the West division title and returns to the post-season for a 3rd consecutive season. The schedule looks manageable for the Hurricane, and even in a year with only 10 starters returning, there is enough talent, led by QB Smith and a stout defense, to earn a trip to the CUSA championship game. IF THINGS DON'T GO SO WELL....The offensive line, with only 1 returning starter and learning a new system, does not develop, and the offense struggles to generate a consistent attack. The opposition is able to expose the rebuilding secondary and offset the Hurricane's top notch defensive front. This all leads to Tulsa battling for a .500 season entering their last game at Rice on November 24th. MAKE OR BREAK: The November 10th visit from Houston has the potential to decide the Western division title. UH thumped Tulsa last season on their way to winning the division championship. The entire offensive line is critical, the loss of 5 seniors hurts this group, and with Smith directing a new system, the line must step up and give him time to find his receivers and make plays down the field. OFFENSE: This unit had major struggles last season, ranking 95th in the nation at 310 yards per game, and now only 4 starters return to help improve this group's production. Joseph Webb looks to take over at quarterback after seeing minimal action last year, completing 33 of 51 attempts for 426 yards. Webb has potential, is only sophomore, and will get to work in offensive coordinator Kim Helton’s pro-style offense. A concern for the UAB staff is replenishing both running back and receiving corps as the top 3 rushers have departed and 4 of the top 5 receivers have also moved on, making Webb look like a veteran in this group. DEFENSE: The Blazers were solid on defense last season, finishing 6th in the conference in both total defense and scoring defense. Like the offense, this unit was gutted and will need to be rebuilt with new faces, starting with the defensive line. The line lost 6 of their top 8 players and returns only one starter in Brandon Jeffries. The entire line is small by Division 1 standards and could quickly be overwhelmed by stout CUSA offensive lines. The strong group of linebackers, led by Joe Henderson, will be relied upon to assist the developing defensive line during the season. SPECIAL TEAMS: Kicker Swayze Waters did a nice job last season, connecting on 9 of 12, and now is likely to be given the punting duties as well in 2007. The other option in the punting game could be incoming freshman Charlie Edwards, who averaged 42 yards per kick as a senior in high school. The punt return game was disastrous last year, averaging 4.6 yards per return and finishing last in the conference. Kevin Sanders returns, hoping to improve on his return game while Rashad Slaughter also returns and could see time taking back both punts and kicks. COACHING: Heading into his 1st season in charge of the UAB program is Neil Callaway, replaceing Watson Brown who spent the past 11 seasons in Birmingham. Callaway joins UAB from the University of Georgia where he was the offensive coordinator for 6 seasons after holding the same position at Alabama the two years prior to Georgia. Former head coach Kim Helton was brought on board as offensive coordinator to rebuild the Blazer attack, while Eric Schumann will direct the defense. SCHEDULE: The Blazers start out with a bang, paying visits to Michigan State and Florida State in the season’s first 2 weeks of action before the home opener versus 1-AA Alcorn State. UAB opens conference play with a tough contest at Tulsa, but does host preseason favorite Southern Miss in early November, followed by East challenger Central Florida. IF EVERYTHING GOES WELL....The Blazers improve over their win total of 3 from 2006 in what appears to be a major rebuilding year. Young QB Joseph Webb establishes himself as a future star in this league, and the inexperienced offensive line develops into a cohesive unit, presenting a foundation to build upon going forward. The players adapt well to the newly installed pro-style offense, and the team looks to be a totally different group by the time the season comes to an end. IF THINGS DON'T GO SO WELL....UAB does not match last season's win total and finishes in last place in the Eastern division. The current players on the roster are not a good fit for OC Kim Helton’s offensive scheme, and with inexperience all throughout the lineup, it is a year of turnovers, penalties, and frustration. The brand new defensive line is unable to generate a pass rush, and the back 7 is exposed by the strong CUSA passing games. MAKE OR BREAK: For a team looking to rebuild, the October 13th game versus Tulane in Birmingham is huge, as a win in the conference home opener could establish a key level of confidence for this young group. Quarterback Webb flashed his potential last season, and now he has to become the main man behind center. Webb is a great athlete and will be asked to learn a new system and become the leader of the developing offense. OFFENSE: The game plan will be focused heavily on the running of Kevin Smith after his 934 yard and 7 touchdown 2006 season. Smith will welcome back 4 starters to the offensive line, led by Kyle Smith, a veteran of 32 starts who will shift to center in his final season. Quarterback Kyle Israel split time last season with Steven Moffett and performed well, hitting 65% of his passes for 6 touchdowns. The job is now all Israel’s, and he will likely look for Rocky Ross as his top target, after star receiver Mike Walker graduated and joined the Jacksonville Jaguars. DEFENSE: The staff will look to bolster the overall speed of this group after the unit struggled all of last season, ranking 106th in the nation and yielding 398 yards per game. The pass defense had major problems last season but returns all 4 starters in what looks to be one of the most improved groups in CUSA. The linebacking unit suffered from injuries last year, with all starters missing time during the season, and the group’s cohesiveness suffered greatly. There are still questions surrounding the LB group, but production should improve from last season as 5 players with starting experience return. SPECIAL TEAMS: The Knights appear to be solid at place-kicker with Mike Torres returning after a 17 for 24 season, including a long of 51 yards. Torres should challenge for 1st team CUSA honors this year and could also be called upon to handle the punting duties. If not Torres, the punting will likely belong to true freshman Blake Clingan, after he averaged 47.0 yards per kick this last season in high school. The punt and kick return units return intact in one of the league’s best, Joe Burnett (PR), who finished 2nd in CUSA last season, and Curtis Francis (KR). COACHING: Heading into his 4th season at UCF, George O’Leary enters a new era of the Golden Knight program, as the school begins play on a brand new on-campus facility that surely will help bring recruits to the Orlando campus. In 2005, O’Leary led UCF to its 1st and only bowl appearance in its history, the Knights' 1st season of CUSA play. One change highlights the staff heading into 2007, as John Skladany was hired as the new defensive coordinator after spending his last 10 seasons at Iowa State. SCHEDULE: The Golden Knights are known for putting together challenging non-conference schedules and this year is no different. The opener is at North Carolina State, followed by a visit from Texas on September 15th as UCF unveils its brand new stadium, while Louisiana-Lafayette and South Florida complete out of conference action. 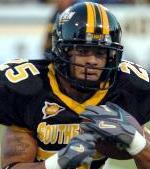 Highlighting the CUSA games is a late October Sunday visit to Southern Miss and a visit from Memphis on September 22nd. The Knights do avoid Houston from the West division, which is a nice break. IF EVERYTHING GOES WELL....The Knights are making reservations for the postseason, and UCF is in the thick of the East division title chase. QB Kyle Israel flourishes in his role now that he is the go-to-guy, and combined with the running of Kevin Smith, the offense makes major improvement over last year’s 19.3 point per game average. The return of 9 starters on defense provides the Knights with the potential to have their best unit in years with standouts Leger Douzable (DE) and Joe Burnett (CB) leading the way. IF THINGS DON'T GO SO WELL....The tough non-conference slate takes its toll as the Knights fall in 3 of 4 contests, and still remain a step behind Southern Miss and Memphis, missing out on the postseason for a 2nd consecutive season. The lack of playmakers at receiver diminishes the effectiveness of QB Israel, and the offense struggles to develop a legitimate passing attack. On defense, the linebacking corps needs to show great improvement over last season if this defense is to improve in 2007. MAKE OR BREAK: The conference opener looms large as Memphis will visit Orlando in a key East division tussle, followed in two weeks by a visit to ECU. A win in those two contests sets the Knights up well for a bowl bid and a title clash with Southern Miss in late October. RB Kevin Smith needs to stay healthy after missing 3 games last season as UCF wants to pound away, and the loss of Smith would significantly reduce the effectiveness of the gameplan. OFFENSE: The Miners will focus on setting up their potent ground game, led by their returning rusher Marcus Thomas. Also expected to earn significant time in the backfield is Oregon transfer Terrell Jackson, as he enters the fray in a talented stable of backs. UTEP will need to replace two of their all time greats as QB Jordan Palmer and WR Johnnie Lee Higgins have graduated, both the school's all time leader in yardage at their positions. Trevor Vittatoe is likely to take over at quarterback after redshirting last season as a freshman, while Joe West is the best of the returning receivers after catching 27 balls last season. DEFENSE: This unit returns only 4 starters from a group that ranked 8th in CUSA in total defense and gave up 31 points per game. The main concern is a defensive front that needs to be rebuilt in its entirety and will rely heavily on junior college transfers to plug the gaps. There's not as much concern at linebacker as there is more experience to work with, led by all star candidate Jeremy Jones who returns after missing almost all of last season due to injury. This group has a lot of questions to answer before the opener. SPECIAL TEAMS: New faces dot this landscape as kicker Jose Martinez and punter Kyle Peterson both emerge from redshirt seasons. Martinez has a great leg and connected on 13 of 16 field goals in 2005 when playing in junior college. Josh Ferguson has to step into the huge shoes of Johnnie Lee Higgins, who would have led the NCAA in punt returns if he had 3 more attempts. Ferguson did see action returning kicks last year, averaging 20 yards on his 15 attempts. COACHING: Mike Price heads into his 4th season on the El Paso campus and looks to take his Miners back to the postseason after missing for the 1st time last year. Price has racked up 21 wins in his 1st 3 years, making him one of the most successful coaches in the history of this program after 3 seasons. Mike’s son Eric is the offensive coordinator and Tim Hundley is the defensive coordinator, and both are also entering their 4th seasons on the Miner staff. SCHEDULE: The Miners open the season at home versus strong Mountain West foe New Mexico, before taking to the road to challenge Texas Tech and New Mexico State. The Miners get a nice break in that they host West division challengers Houston and UTEP, in addition to East favorite Southern Miss. The toughest CUSA games appear to be a late September visit to SMU and the season finale at UCF. IF EVERYTHING GOES WELL....The Miners split their non-conference games and take advantage of hosting both Tulsa and Houston by proceeding to win at least 6 games and returning to the postseason following a one-year absence. UTEP is able to establish a power running game with a strong and diverse stable of running backs that is capable of putting up huge numbers on the ground. The power running game allows new QB Vittatoe to develop slowly as he takes his 1st collegiate snaps behind center. IF THINGS DON'T GO SO WELL....The Miners lose their first 3 games and struggle in West division contests, finishing behind Houston, Tulsa, and SMU and falling below .500 for a 2nd consecutive season. The rebuilt and inexperienced defense cannot get on track until late in the season, and the Miners' offense is unable to overcome the team’s defensive shortcomings. The defense was terrible last year, and with new faces dotting the landscape this season, there are concerns on how fast this group will develop. MAKE OR BREAK: A key non-conference game for this groups bowl hopes is on September 15th when the Miners travel to a resurgent New Mexico State program. UTEP won a thriller last season and may need to do the same this year if they want to entertain bowl hopes. The conference opener also looms large as UTEP heads to an improved SMU team, followed by a visit from division contender Tulsa, as the Miners will know where they stand in CUSA by the 1st week of October. RB Marcus Thomas will be relied on to not only establish a power rushing attack but also to be a major receiving threat out of the backfield, and he holds the key to this offense's overall development. Both Southern Miss and Houston return enough talent to make a repeat of last year’s league championship game seem likely. CUSA is an extremely balanced league, and there is always a surprise team that emerges during the season to throw a jolt into the title chase. This year’s likely party crasher should come from the group of Tulsa, SMU, Memphis, and Central Florida, with UTEP also focused on causing problems for the returning division champions. One team to keep an eye on is Marshall. Although possibly still a year away from the postseason, this program is on the upswing as it adapts to CUSA play. Both Marshall and East Carolina have enough potential to play the spoiler role this season. UAB, Tulane, and Rice look to be in rebuilding mode and will be focused on developing talent for the future with their young teams. Overall, it looks to be an improved season for the conference with the league being quite capable of matching last season’s 5 bowl bids and building on last year's lone win in the postseason.